In 'Tucumcari' I was drawing inspiration from Cave Art paintings that would serve as maps, historical records and stories but also reflect man's innate desire to paint and to create art. 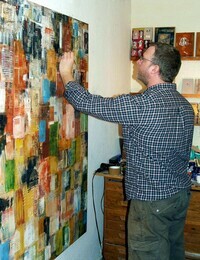 This work is primarily layers of painting combined with collaged elements. However, I also use the decollage technique - I build up layers of composition, color and abstract imagery and then strip parts away by cutting, tearing or sanding. I repeat this process until the work reaches a balance and is finished.